What to do if you don’t ski? How about snowmobiling? 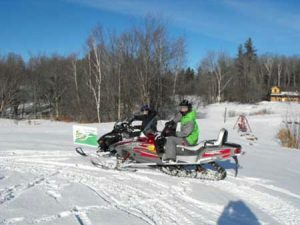 With nearby Green Mountain Snowmobiles, it’s easy to go snowmobiling at Sterling Ridge. This activity has quickly become one of my favorites! 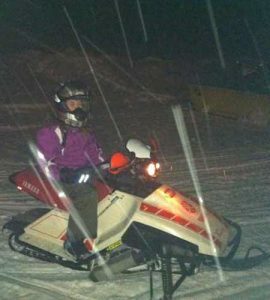 Also know as slednecking, sledding, and skimobiling, this is for many of you readers a first time adventure and a 1 hour tour is perfect to start off. I have seen people who have never seen snow and been very hesitant about operating a snowmobile, start riding and by the end of an hour tour they are hooked! What is the recipe for a great trip? First start with an open mind – do not limit yourself. Snowmobile touring outfits offer a variety of options, Green Mountain Snowmobiles in Jeffersonville, VT has day and evening tours – both being equally great – especially the evening tour when your senses are working over time, snow covered trees, mountain-scapes, stars and when the full moon is out… breathless. The second ingredient for this activity is again: gear – helmet (provided by touring company), good gloves, boots (other than fashion boots or ski boots), winter jacket, winter pants and definitely hand warmers for the passenger (drivers have them built into the handle bars!) Finally, as in every great adventure, relaxing and having an open mind.